November is Pet Diabetes Awareness Month. In pets, just as in humans, diabetes occurs when the body does not make enough insulin, stops producing it, or doesn’t use insulin properly. Insulin is needed to convert sugars (specifically glucose) in the bloodstream into energy in the body’s cells. With diabetes, the cells do not have enough energy to function properly. The body then begins to breakdown body tissues which are converted to sugar by the liver. Diabetes can lead to serious health problems, including liver disease, kidney disease, seizures, cataracts/blindness, increased risk of infections, and even death if the condition is not treated. Though diabetes affects less than 1% of dogs and cats, it’s important to be aware of the risks and signs. Risk factors include age (older dogs and cats are more susceptible), obesity, inactivity, and genetics. Certain breeds of dogs are at a higher risk for developing diabetes, including the Australian Terrier, Bichon Frisé, Cairn Terrier, Fox Terrier, Keeshond, and Miniature and Standard Poodles. 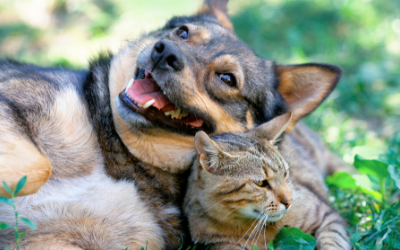 Unspayed female dogs and neutered male cats are also at a greater risk for developing diabetes. Fortunately, the treatment and management of diabetes can be accomplished through a partnership with your veterinarian. As with people, diabetes is often controlled with insulin injections, typically given twice a day. Many pet owners are anxious about giving injections, either for fear of hurting their pet or feeling unable to do it. In fact, it’s easier than you think, and most cats and dogs tolerate the injections quite well. Your veterinary health care team will show you how to give injections to your pet. Diet and feeding times are important in the management of diabetes. Your veterinarian will recommend a diet that is best your pet. It is important to feed your pet at the same time each day and keep meal sizes the same. Your pet should be fed the amount of food required for his ideal body weight. Taking your pet for regular veterinary checkups is an important part of diabetes management. Your veterinarian will recommend visits at regular intervals to monitor your pet’s condition. A diagnosis of diabetes can be overwhelming, but the sooner it is diagnosed, the sooner it can be treated. If you notice any signs associated with diabetes, discuss them with your veterinarian. By Appointment Only - Appointments start at 10 a.m. Drop offs and pick ups as of 8 a.m. For Emergencies after hours, please call: Campus Estates Animal Hospital - 519-837-1214.